Ever wonder what happens to the luggage that is unclaimed at the airport? One percent of bags go unclaimed every year in the U.S., but with nearly 700 million airline passengers it adds up to quite a bit of stuff. So what happens to all of it? CBS News Travel Editor Peter Greenberg unlocked the mystery, finding the end of the line for lost luggage. 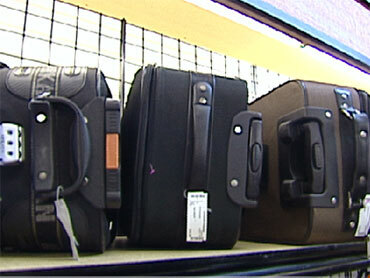 On "The Early Show" Greenberg introduced viewers to the Unclaimed Baggage Center in Scottsboro, Ala. They sell everything. Cameras, cell phones, iPods, computers, shoes, hand bags, baby strollers and jewelry are just some of the items you can find at the discount center. The cavernous warehouse is one of the biggest tourist attractions in the state. But it's all your stuff. Greenberg met Jerry Jeffrey at the store, who was looking for a bargain for his wife. Greenberg pointed out a $4,000 bracelet and joked that he had to buy something because he was on TV. "Well, yeah," Jeffrey said, "but I don't know about a $4,000 bracelet. (It would) take more than TV." The store also featured a 1.6 carat diamond that costs more than $17,800. Greenberg said that's not a bad deal at half the price of the appraised value. In fact, all of the items in the store are 20 to 80 percent off of the regular retail price. Brenda Cantrell, the store's director of marketing, says the bags are purchased sight unseen. After a carrier pays a claim, the bags make their way to the center. She explained, "We have contracts with the carriers in the country, and then we send our own transportation around the country to pick them up and bring them back here to Scottsboro." Airlines typically hold unclaimed luggage for 90 days and if it isn't picked up, chances are it will end up at the center. Every day, 7,000 new items come into the store. The family-run company is in its 40th year and going strong. About 800,000 customers walk through these store's doors every year. Aisha Raheem drives from Chattanooga, Tenn., to shop at the center about once a month. She said she bought her daughter's wedding dress at the store. Greenberg noted 60 percent of the merchandise is clothing, with much of it still bearing the original price tags. He added a third of the items they get are thrown away, a third are donated to charity and a third are sold.